The Jokari 229482 Dressing Lid converts inappropriate squeeze bottle lids to appropriate squeeze bottle lids. 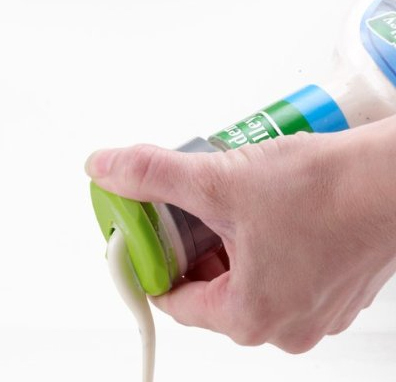 That is, the kitchen gadget lets you control how much salad dressing you want. No more over-pouring, no more soggy lettuce. Perhaps more importantly, the device actually facilitates in portion control. 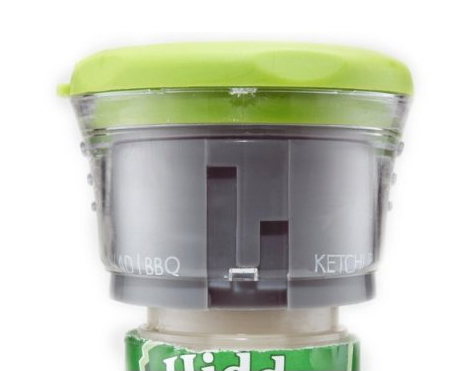 The little lid that could features a dial that changes the amount of the condiment you are using. Choose from several different everyday condiments and squeeze with confidence in knowing how much you are getting. Just make sure you take off the top when you are using it to pour out some ranch dressing to dip your french fries in—a small bowl is necessary for that. Dispense one serving at a time. Condiments are frequently over used adding empty calories to foods and leaving pools of uneaten dressing at each meal. The Healthy Steps Portion Lid measures and dispenses one serving of dressing so you can be confident in your portion sizes and yourself. BPA-free. Fits most store bought condiment bottles, use with: Salad dressing, Mayonnaise, Ketchup, BBQ sauce and more. How to use: Replace existing condiment lid with the Portion Lid. Turn Portion Lid to condiment type indicator on lid. Squeeze bottle to fill single serving chamber. Open Portion Lid and pull chamber edges toward bottom of bottle to dispense. Remove Portion Lid when bottle is empty, wash before reuse. Top rack dishwasher safe.